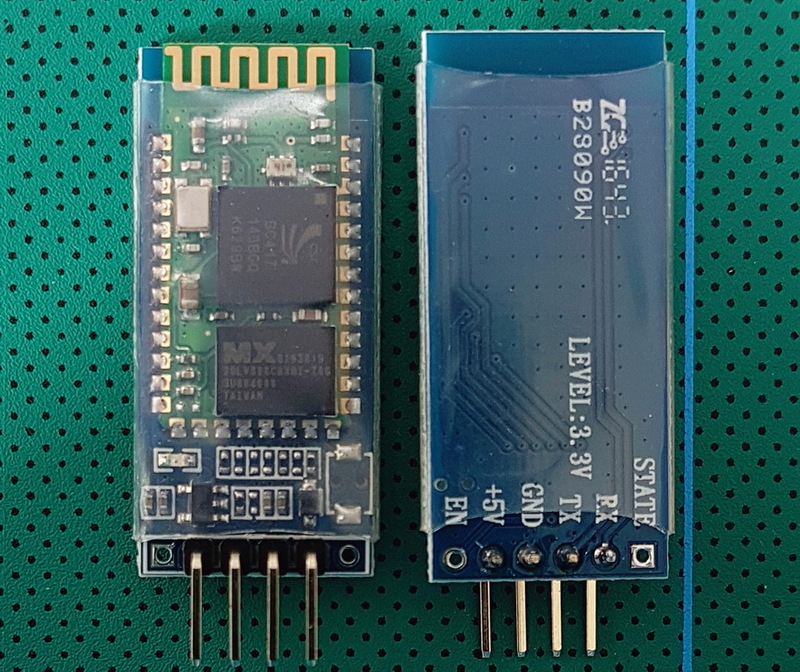 The HC-06 (ZG-B23090W) uses a regular smd Bluetooth module based on the csr BC417 chip with a MX 29LV800CBXBI-70G flash memory chip. The firmware is well documented and a Google search for “HC-06 linvor V1.8″ should get you more than a few hits. The HC-06 is a Bluetooth 2.0/2.1 EDR device that has a serial UART layer on top of the Bluetooth. The UART layer makes them extremely easy to use but hides the Bluetooth functions from the user. This is good if all you want is to make 2 things talk to each other. The HC-06 has 2 modes of operation; AT mode and transmission mode. When the modules are first powered on they go in to AT mode. Here AT commands can be entered via the wired serial connection. After a connection has been made the modules go in to transmission mode. Here everything the modules receives via the wired serial connection is sent to the connected device. At commands cannot be entered again until the connection is broken. HC-06s are slave only modules and require a master device to make a connection. Slave devices cannot initiate a connection which means you cannot link 2 HC-06s together. The master module is the HC-05 which can be either slave or master. Since the price for the HC-05 and the HC-06 is basically the same I would suggest buying HC-05s and not HC-06s. The datasheet available from the Taobao sellers is the Wavesen Chinese data sheet. You can download it at the bottom of the page. Note that the data sheet looks to be version 2.0 but the firmware is 1.8. All the commands in the data sheet work though. I have included an older English data sheet for the same firmware in the downloads section below. The first thing with any new Bluetooth module is to power them up and see if they work and what name they transmit. Both modules seem to work fine and they transmit “HC-06″. So no surprises there. 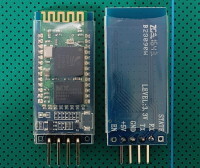 The modules pair with the PIN “1234”. Again this is standard. When powered on the LED flashes about 10 times a second. When there is an active connection the LED is solid on. The HC-06 starts in AT command mode on power on and expects commands to be uppercase without line endings (so no \r\n characters). The HC-06 does not have many commands, apart from setting the baud rate and renaming it, there isn’t a lot you can do. Take care. Most PCs cannot use a baud rate above 115200. The maximum length is 20 characters. You may need to reset the module before the new name is broadcast. The baud rate and PIN cannot be interrogated so take care when setting. Although the PIN can be reset using AT commands you need to know the baud rate to use AT commands. Most PCs cannot use a baud rate above 115200 and there is not way to hardware reset these modules. Next up is to see if we can talk to them using AT commands. I normally use the Arduino serial monitor. 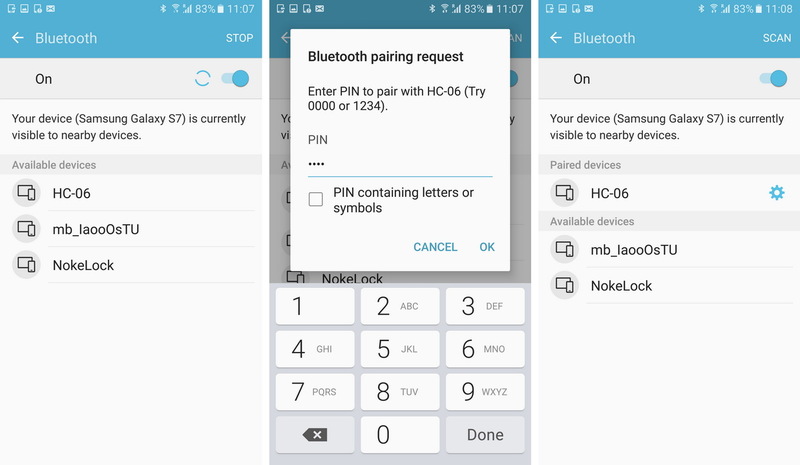 There are a few ways to connect serial Bluetooth modules to a PC. The main two are; via a serial UART adapter, or, by using an Arduino and a serial-in serial-out sketch. Uing an Arduino and a simple serial in – serial out sketch. The 2 resistors form a voltage divider and reduce the 5V Arduino TX pin to 3.3v. The Arduino reads 3.3v as HIGH so we do not need to convert the 3.3v on the BT module TX pin. 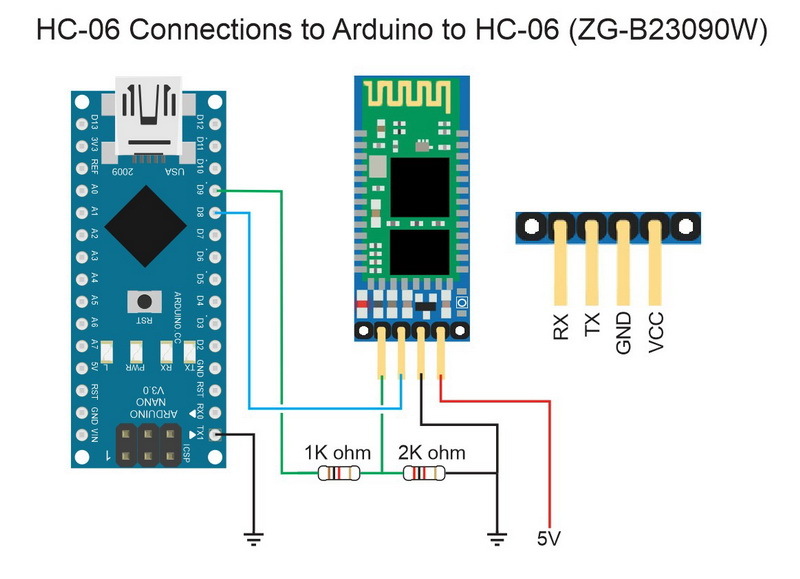 We can connect it directly to the Arduino RX pin. 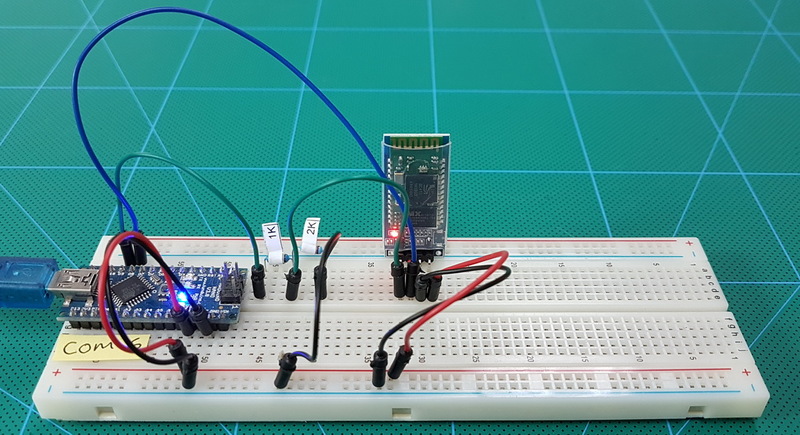 This entry was posted in Arduino, Bluetooth and tagged Bluetooth, HC-06 by Martyn. Bookmark the permalink. Double check the connections and the resistor values. Make sure you have no line endings selected. What name does the module broadcast? The Arduino unit is a ‘copy’ one but its the same as the unit in my drop controller which works fine… the HC-06 module is a n other eBay one but again works fine in the drop controller I built.. I presume the 2 are the same module? Can you try swapping them. I had the same problem with HC-06 clone with pushbutton pads what I got from China, it did not react on AT commands from Serial monitor with no line ending /9600 configuration. I changed Serial monitor configuration to Both NL & CR and at least AT and AT+VERSION commands now are working. Version is 3.0-20170609, probably Y2017 edition. I recently bought some HC-06 modules. Five, in fact. three of them were of one type with no pads for a pushbutton. The boards had http://www.hc01.com written on the BT module. They were just fine. Behaved exactly as expected. Two others were the same as each other, had no identifying marks on the module and did have pushbutton pads. These boards were already configured to work at 38400 baud. They advertise on BT at HC06 and connect just fine. However, nothing I could do would get them into command mode. Not combination of activity on the power and (I presume) command pin (34) had any effect. I have an Arduino sketch that tries to communicate at a list of available speeds. Not response to AT commands at all. Although they work fine, they are no good to me if I cannot change the name. So – the question is, have you come across boards that look like HC-06, advertise as HC06 but will not respond to AT commands? I wouldn’t mind but none of theme were even the JY-MCU boars that I ordered. Since they were cheap from ebay, I still get three useable boards for a reasonable price but I would like to make the other two work. It is very possible they have a different firmware. Try a combination of upper and lower case, with and without line end characters. 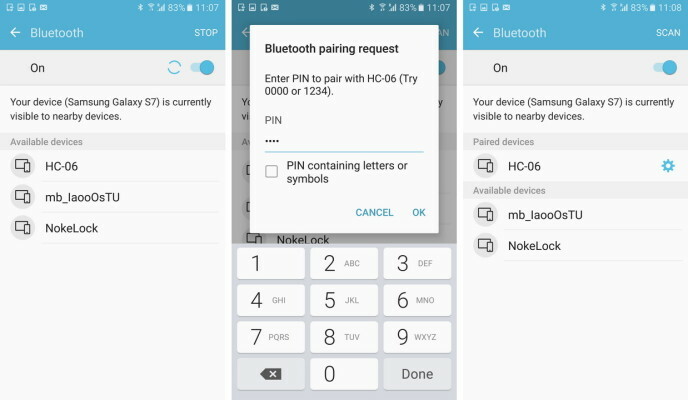 Pin 34 is only used for HC-05s. The HC-06 enters AT command mode at start up. HC-06 is factory-set to either Slave or Master (they are typically designated HC-06M and HC-06S). If not specified, than you are probably buying Master pre-set module usually has big white paint mark on the BC417 chip. AT command set is narrowed to bare essentials – baud rate, name, pin, and parity. Get one Master and one Slave, have them pair once, and they will pair automatically on power-on forever. Great to put into project and never need to touch again. HC05 _requires_ CRLF (\r\n) along with the AT command. For example “AT\r\n” should return “OK”. HC 06 _must not_ have any line ending, only the command. For example, “AT” should return “OK”. I have a same BT module. Thanks fo your tutorial!